Built in 1997 and renovated completely in 2011, this prestigious ship offers beautiful and comfortable rooms which coupled with the fantastic service and incredible views along the Rhine. 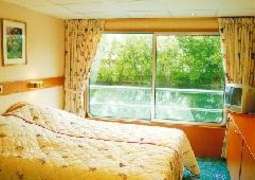 The large and comfortable cabins aboard the Douce France are all outside cabins with a window allowing you to get a fantastic glimpse of the passing scenery. The warm colours and elegant furnishings create a pleasant and exciting atmosphere for each and every passenger. The elegant restaurant aboard this superb ship serves incredible Mediterranean and European cuisine served with a selection of fine wines, beers or other drinks. After an exciting day of travelling you can relax in the lounge or at the bar with a nice drink of your choice. “Boredom” is a word which is totally unheard of aboard the Douce France – the many excursions during the day and evening programs allow you to see and learn many new things as well as meet some great people. Those who would prefer a more peaceful journey there is a small reading area where you can sit back and relax with a book. There is also a shop on board where you can purchase small souvenirs for loved ones back home. As there is a friendly and casual atmosphere aboard the Douce France, it is recommended that you also wear casual attire except in the evenings when more formal clothing is advisable.